Love the watch and looks great.When I received the watch I set the time and the date,noticed the small second hand moving when I pushed in on the crown but not the large second hand.I thought I was going to have to send the watch back until I read the instructions.The large second hand works with the chronograph mode,what a relief!! This is a very nice pilot-style watch, giving you that "instrument panel on the wrist" look but with stylish touches like the rose-gold tone and textured blue dial to also allow it to be used when dressy styles are desired. The chronograph's seconds hand is the red centrally-located hand, and when reset, the chronograph's hands quickly return to zero, instead of slowly spinning round and round. 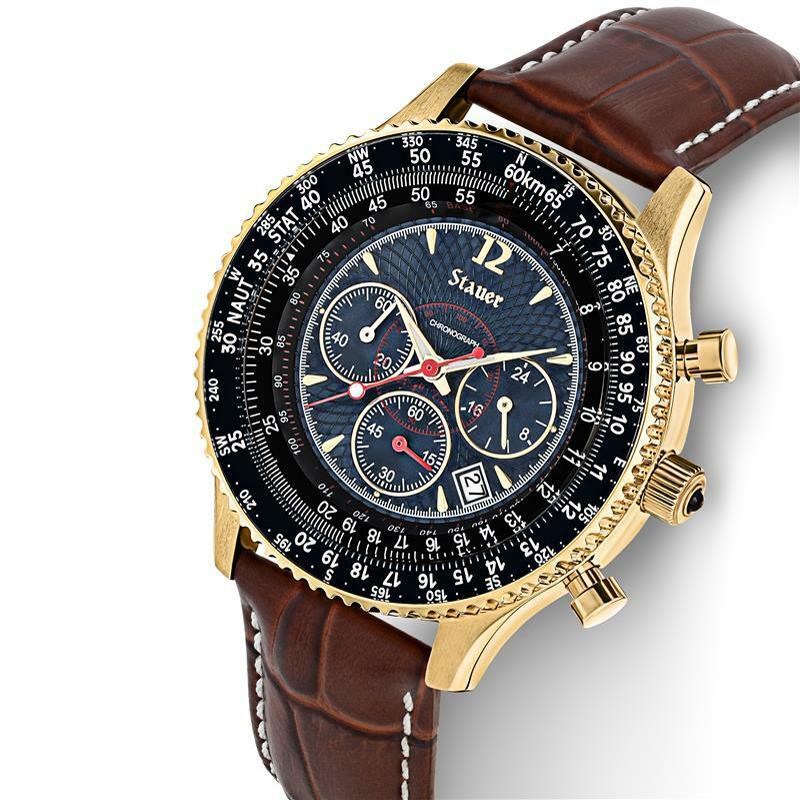 The watch also includes the date and a tachymeter scale (used with the chronograph to estimate the speed of an object). Which brings us to the rotating slide rule bezel. This is where some improvement is needed. It is a true, bi-directional rotating slide-rule bezel, but some of the numbers are a little out of place, causing some calculations to be a little inaccurate. Treat any calculation results with this slide rule as VERY approximate. Plus, the hash marks around the bezel are too close together and too similar in size to be useful. Otherwise, a nice, substantial watch. 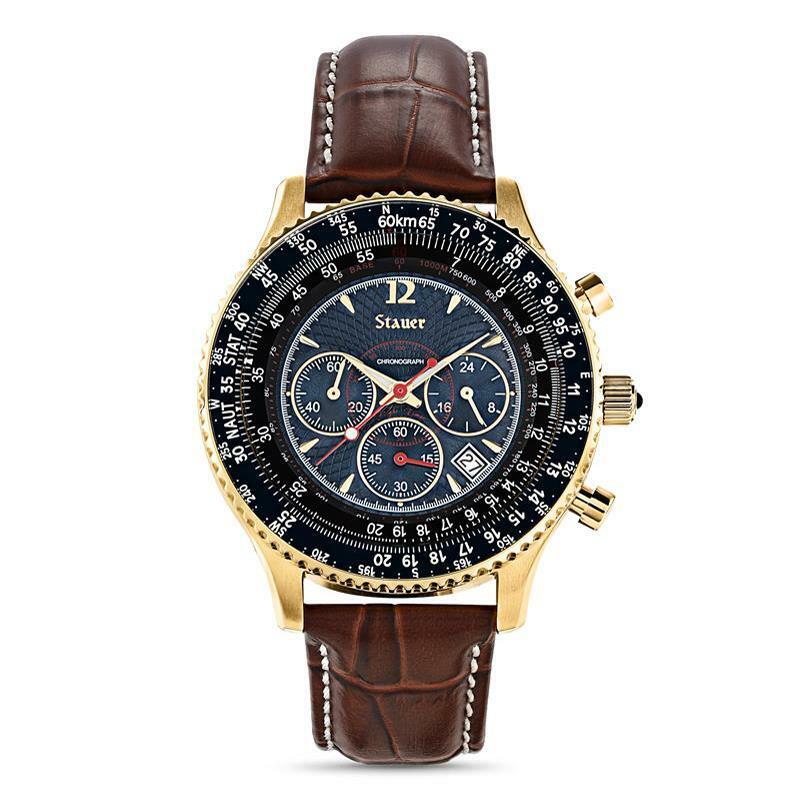 I saw this watch in the Stauer catalog and thought it was beautiful and a good price. My wife bought it for me as a Christmas present and I could not be happier with it. The chronograph features, color, case and leather band are beautiful, work great and I am very happy with it. In World War I, Dieudonne Costes fought head-to-head against lead-spitting enemy planes over the Balkans. In WWI dogfights, victory was decided in a fraction of a second. The first multi-function wristwatches forever changed air combat, allowing pilots to time complicated maneuvers and coordinate attacks. Ten years later, the crack French pilot faced a different kind of challenge: navigating the pitch black skies over the South Atlantic. Behind the stick of his aircraft, he soared across the time zones from Senegal to Brazil, setting the record for the world’s first non-stop flight across the South Atlantic. We studied countless classic aviator timepieces to match the vintage styling and design. Our watchmakers updated the movement for the 21st century, making it even more accurate and reliable than the originals. The Stauer Flyboy Blue features a stunning cobalt blue dial, set inside a case finished in gold. Three tachymeters and a movable bezel measure speed and ascent and the chronograph functions allow you to measure elapsed time. Interior complications mark minutes and hours and include a 24-hour display. The watch is water-resistant to 3 ATM and features a crocodile-embossed, genuine leather band. As a fully-loaded precision timepiece with fighting good looks, priced to take out the competition, the Flyboy® Blue is without a doubt, your secret advantage. Fits wrists 6 ¾" to 9"